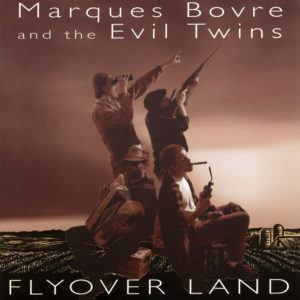 Ghost Stories from Lonesome County is a 1994 CD release by Marques Bovre and the Evil Twins. Engineered and mixed by Doug Erickson at Smart Studios in Madison, Wisconsin from May through September, 1993. Produced by Doug Erickson and MBET. Digital Editing by Tom Blain. Mastered by Dr. Toby Mountain, Northwestern Digital in December, 1993. Photography and layout by Kent Tenney. Location photography at Hauge Log Church. Gas pump photograph by Eric Lynn. Executive producer: Tag Evers. Released on compact disc and cassette on March 5, 1994 (Boat Records MB 1038).